Natural horse hoof care is often overlooked by horse owners, even though it is a critical component in the health and well-being of horses. Most, if not all horses, can benefit from living barefoot, with hooves safe from destructive metal horse shoes and nails. With the correct natural hoof trimming methods, and plenty of space and time to move about, horses will grow strong, healthy hooves. What is Natural Horse Hoof Care? We became passionate about natural horse hoof care shortly after acquiring our horse Comet. He was foundered, and it has taken almost a year for him to grow healthier hooves. He still has some hoof wall separation, but has grown in a thick sole, and thankfully is not dealing with painful hoof abscesses anymore. 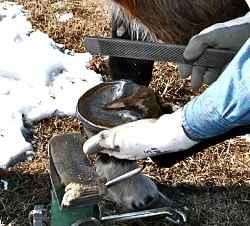 In order to help him we read all we could about natural hoof care for horses, studied Pete Ramey's Under the Horse 10 DVD series, and took a natural hoof trimming course. We now trim his hooves regularly to help them grow in a natural shape. A key part in helping his hooves grow in healthy was drastically changing his diet. We used a grazing muzzle to restrict his grass intake, while still allowing him to be out in the pasture with the herd 24 hours a day! When a horse is barefoot~or without shoes~the hoof is allowed to work as nature intended, acting as both a shock absorber, and a pump, keeping the horse's blood flowing freely with each step. To keep your barefoot horse in great shape, regular trims by an experienced barefoot trimmer are key. Natural hoof trimming is different from the regular pasture trim, and is modeled after the shape of a wild horse hoof. For more information and pictures of the tools needed for natural hoof trimming click here to visit the hoof trimmer page. To help your horse transition out of horse shoes, or when barefoot riding on rough rocky terrain, horse hoof boots such as Easy Boots offer extra protection and comfort. Most of the diseases and conditions of the hoof require at least initial diagnosis and treatment from an equine veterinarian or a professional natural hoof trimmer or farrier. Even if you think you know what is wrong with your horse, it is always best to consult with the professionals! If your horse comes up lame and you don't know why, don't hesitate to call for help! That said, it is definitely in your horse's best interest for you to get a solid understanding of these ailments, and general horse hoof care! Horse laminitis (often called equine founder) is one of the most common hoof problems, and many horse owners don't even realize their horses have had a case. 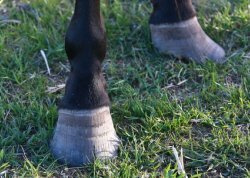 Mild cases, often caused by a slightly rich meal of green grass or grain, may not lead to lameness, or obvious signs of trouble, but damage is still done to the hoof. More serious cases cause inflammation, pain and hoof wall separation. 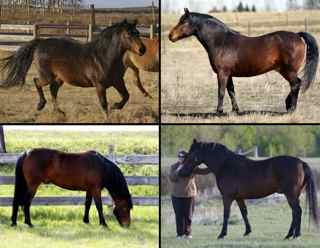 The most common cause is also dietary, and could be one large meal...such as when a horse breaks into the feed room...or could be from daily feasting on lush grass, particularly in the spring and fall. By learning about laminitis, and how to spot the signs and symptoms, you as a horse owner can help treat and prevent it from becoming a chronic and dangerous condition in your horse. Please click here to visit our Horse Laminits page. Acute cases of laminitis require immediate veterinary care. Hoof abscesses are one of the most painful conditions I have seen when it comes to the hoof. It is heartbreaking to watch your horse struggle to move or put weight on a foot, knowing there is little you can do but wait for the abscess to break. A hoof abscess can be caused by a puncture such as stepping on a nail or a stone bruise among other causes. Some horses seem more prone to them than others, and may have frequent hoof abscesses. Click here to read more about hoof abscesses.